Recently I took to polling associates via Twitter about what manner of sandwiches they might like to see, and brie was one of the answers that came back. That sounded like a fine idea to me, and after a bit of thinking I had two ideas ready to go. 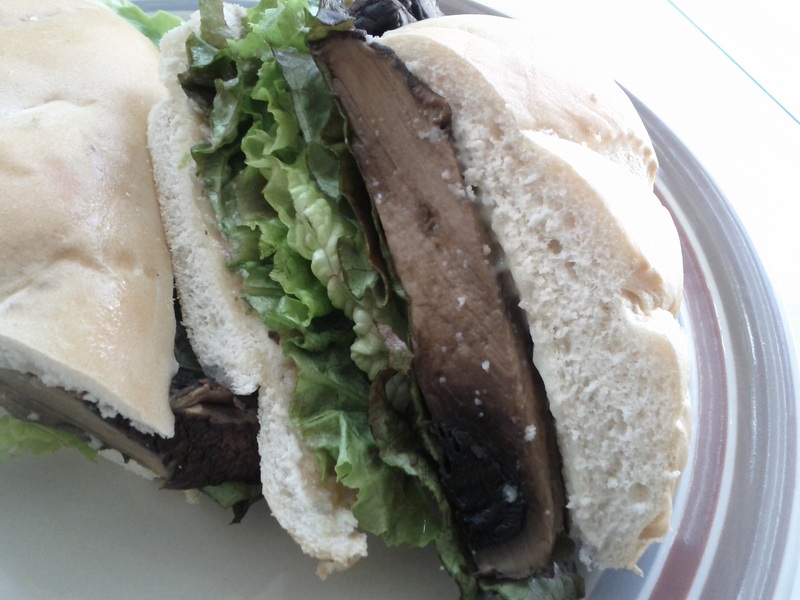 The first, seen above, is a simple sandwich of roasted garlic, red lettuce, slices of roasted portobello mushroom, and brie. The brie was softened a bit and spread on the top half of the bun, and a layer of roasted garlic went on the bottom half. This is one of those straightforward numbers that’s either going to sound good to you or it isn’t, and little I say can sway anyone in one direction or the other. If you like mushrooms, this is outstanding. The portobello is its meaty, delicious self, the roasted garlic is sweet and subtle, and the tangy brie sets off the other two flavors quite nicely. The final sandwich had a bit more brie than what you see above, because I started with a moderate amount in hopes of avoiding an overwhelming presence. I’m no great cheese booster, and so I prefer a careful hand. If you love the stuff, by all means pile it on. The second sandwich I put together is a bit more complicated. 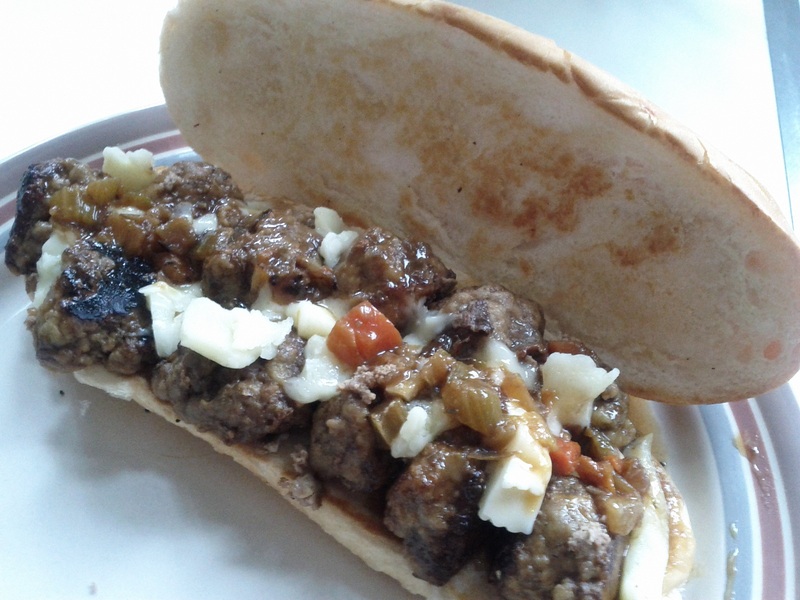 Technically speaking, it’s boulettes d’agneau avec espagnole et brie, which is to say it’s a meatball sub, except the meatballs are made of lamb, the sauce is brown sauce, and the cheese is brie. This, friends, was outstanding. I buttered the bread and put it face-down in a skillet before assembling the sandwich, and this was the touch that walked the sandwich just to the edge of too much. That I had the meatball sub archetype to guide me helps, as it kept me from piling on ingredients that would have done little but turn a lovely ensemble into a cacophonous chorus. Not every sandwich I make is a success, and I’m happy to own up when something doesn’t turn out as well as it could, but I’m also not embarrassed to announce when I’ve got something that works. This is a fine, fine sandwich. This entry was posted in Sandwich Reviews and tagged Lamb, Reviews by Pete, Sandwiches I Have Made by Pete. Bookmark the permalink.